Draughtsman, engraver and painter, part of a French family of artists. The brothers Louis-Gabriel (1740-1805) and Jean-Michel Moreau (1741-1814) were the sons of a Paris wigmaker. They both worked in the same media but achieved success in different fields, Louis-Gabriel working principally as an innovative landscape painter and Jean-Michel as a book illustrator and a recorder of contemporary manners and events. Horace Vernet was Jean-Michel s grandson, from the marriage of his daughter to Carle Vernet. Jean-Michel Moreau (Moreau le Jeune; Moreau the Younger) was the pupil of the painter and engraver Louis-Joseph Le Lorrain, with whom he went to St Petersburg in 1758 on Le Lorrain s appointment as first director of the Academy of Fine Arts. Moreau was appointed a professor of drawing at the Academy. He executed a number of works in Russia, including a red-chalk portrait of the Empress Elizabeth (Paris, Bibliothèque Nationale, Paris). In 1759 he returned to Paris and, virtually abandoning painting, entered the workshop of the engraver Jacques-Philippe Lebas, producing drawings for engravers to work from after such contemporary artists as Franois Boucher and Jean-Baptiste Greuze, as well as after Rembrandt and other Old Masters. During the 1760s he also provided drawings to be engraved for Caylus s Recueil d antiquits and for Diderot and d Alembert s Encyclopdie and collaborated as an engraver with Boucher, Franois Eisen, Hubert-Franois Gravelot and Charles Monnet on the illustrations for an edition of Ovid s Metamorphoses. By 1770, the year in which he succeeded Charles-Nicolas Cochin II as Dessinateur des Menus Plaisirs du Roi, his career was sufficiently well established for him to employ other engravers including Noël Le Mire, Nicolas and Robert De Launay and Elise Saugrain to reproduce his own designs. Popular and successful, he illustrated a large number of literary works including the Chansons of Laborde (1773), the collected works of Rousseau (1773-82) and the collected works of Voltaire (1782-89). 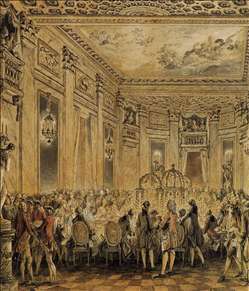 In his role as draughtsman to the Menus Plaisirs, and from 1781 as Dessinateur et Graveur du Cabinet du Roi, he recorded many court festivities in drawings of great finesse, such as the pen and wash Illumination of the Park at Versailles on the Occasion of the Marriage of the Dauphin (1770; Paris, Louvre), which amply demonstrates his mastery of composition, detail and handling of light. His best-known works, which provide an incomparable record of the fashionable dress and manners of the last years of the ancien rgime, are the many illustrations that he contributed to the second and third series of the famous Monument du costume physique et morale (1777, 1783), published by his uncle by marriage, Laurent-Franois Prault. See more details about "Banquet Given in the Presence of the King"